The Scavengers have never been more unsettlingly weird. In The Walking Dead’s “Time for After,” Eugene and his ridiculous dialogue take center stage, yet somehow even stranger things happen with the Scavengers, who keep Rick Grimes as a nearly-naked prisoner for the duration of the episode. 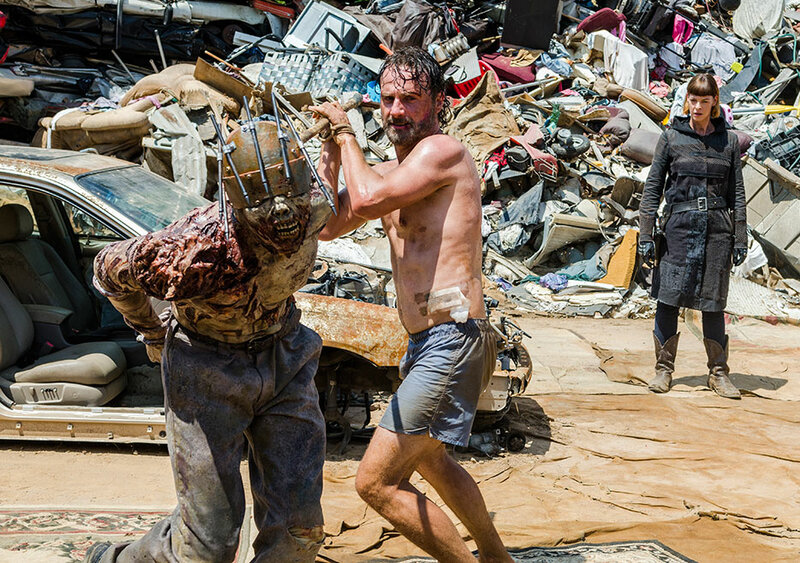 We can’t possibly understand how or why this is happening — especially because it’s nigh impossible to understand what any Scavengers says — but it’s a bizarre delight to watch Rick prance around in his underpants shoving a zombie around. At the end of Episode 6, Rick went alone to the Scavengers’ trash heap of a home and urged them to dissolve their alliance with Negan. 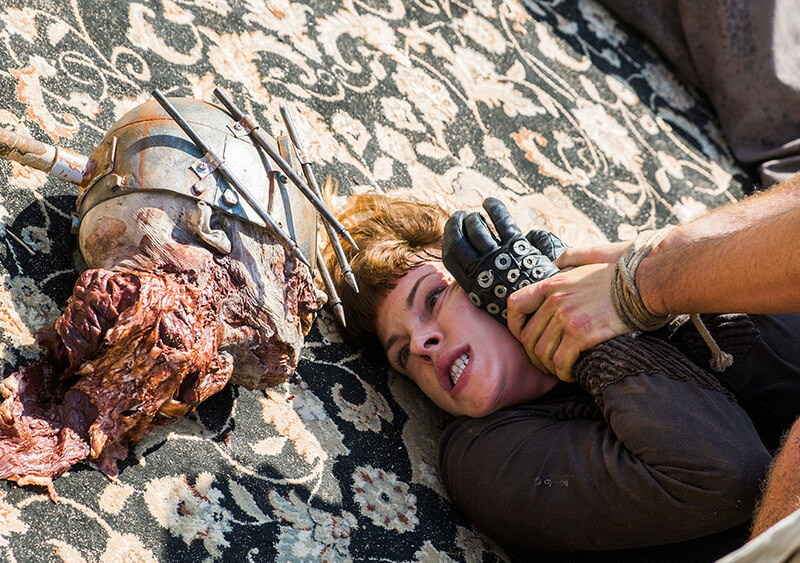 Jadis refused — obviously — and they just took Rick prisoner. This week, Rick’s kept in a sweltering shipping container in his underpants. Jadis takes pictures of him and someone else draw him in preparation for something Jadis says will happen “after.” They talk about sculpting him, but it’s hard to tell what their real plan is. These trash people have always been the only thing on this show more confusing than Eugene’s dialogue (Eugene: “Ergo I need the giggle juice.”) So what are they really trying to accomplish with Rick? Is there a point to this nakedness? As it turns out, they’re probably prepping him to become their zombified new pet. 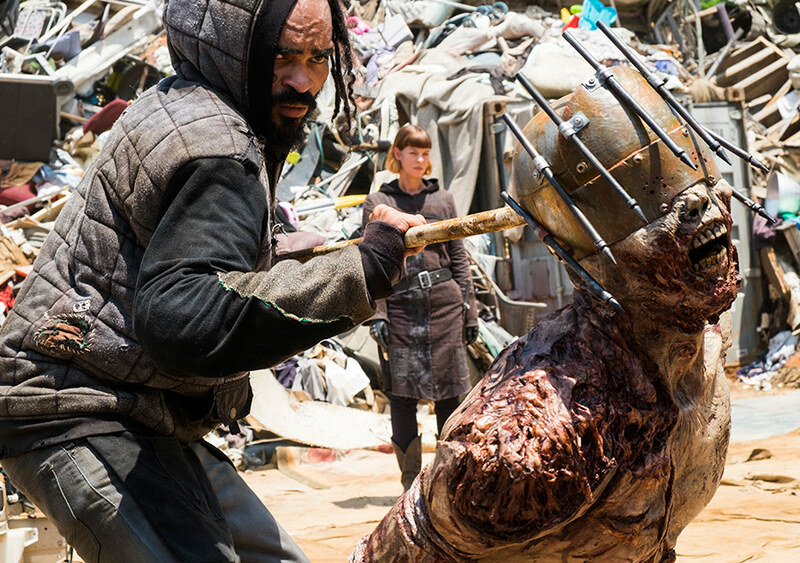 You might remember that when we first met the Scavengers last season, Jadis made Rick fight a spiked zombie named Winslow in a gladiatorial matchup. Rick won. Here in the present day, when Jadis finally says “time for after,” they bring a pet zombie out from a different shipping container, seemingly with the goal of infecting Rick to become the same. Imagine how badass it would be if the Scavengers could parade a naked zombified Rick around as a trophy? The Scavengers are up to their old tricks. Hilariously, impossibly, amazingly, Rick is able to fend everyone off despite being almost naked with his hands bound. Rick makes short work of the incompetent guard holding him down. Then he tackles the one holding the stick behind the pet zombie’s head. He’s able to grab the stick himself and uses it to smack the two guards in the head a few times. Why doesn’t he just shove the zombie’s face at them? Maybe because Rick’s still a really nice guy. The entire scene is totally ridiculous and amazing. Look at Rick prance around with that pet zombie. For some reason, Jadis waits to intervene until after Rick has taken out both guards and ripped the zombie’s head off. Still naked and bound, he pins her to the ground inches from the zombie’s jaws. 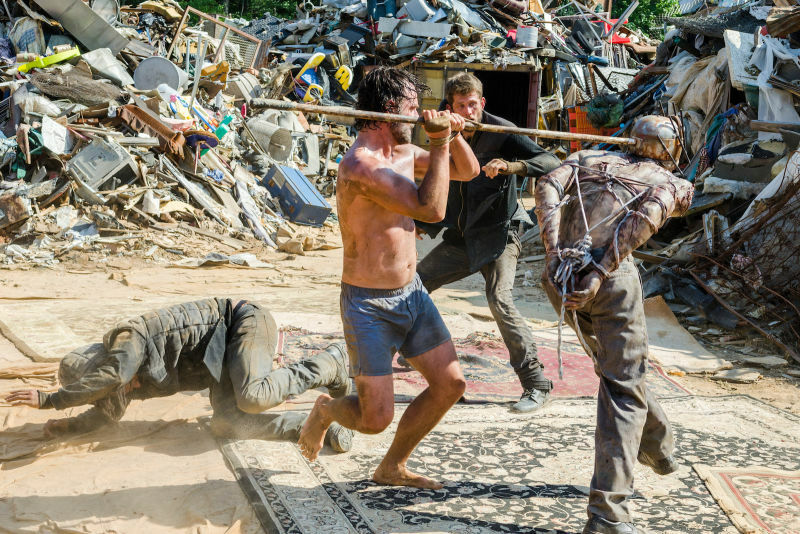 More than a dozen armed Scavengers come out of nowhere, and after making a few threats, Rick convinces Jadis to finally join them against Negan. Jadis still wants to sculpt Rick when the war’s over, completely naked, but Rick has more dignity than that. Rick gets the Scavengers to join up in the weirdest way possible. The Walking Dead airs Sundays on AMC at 9 p.m. Eastern.